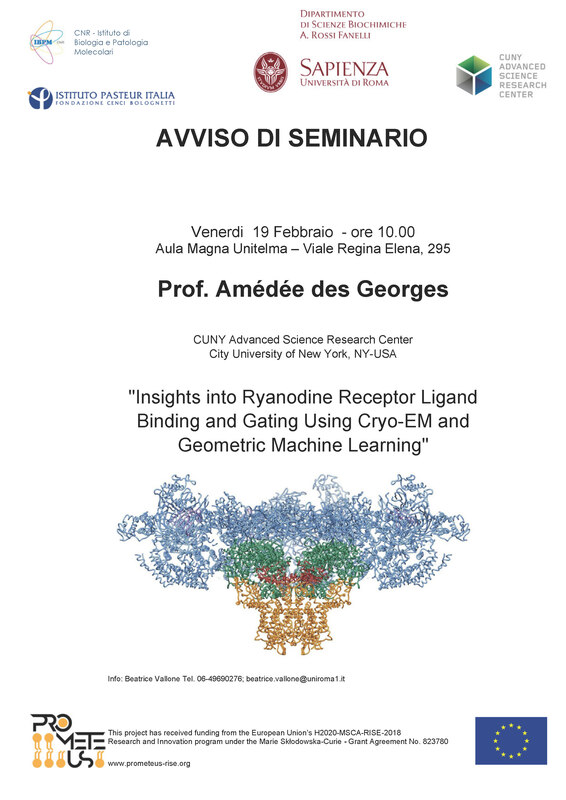 Titolo: IBPM-CNR Seminar announcement: prof. Amédée des Georges "Insights into Ryanodine Receptor Ligand Binding and Gating Using Cryo-EM and Geometric Machine Learning"
"Insights into Ryanodine Receptor Ligand Binding and Gating Using Cryo-EM and Geometric Machine Learning"
The ryanodine receptor is a Ca2+ channel involved in heart and skeletal muscle excitation/contraction coupling and responsible for a number of heart and skeletal diseases. This motivates the study of its function and regulation at the molecular level. Using 800,000 cryo-EM snapshots of ryanodine receptors (RyR1), we employed a geometric machine learning technique called manifold embedding to generate reaction coordinates, free-energy landscapes, and three-dimensional movies depicting continuous conformational changes associated with the binding of RyR1 activating ligands (calcium, ATP, caffeine). This study has provided new insights into the local structural changes along the ligand-binding route, including accommodations at the ligand binding sites, and has shed light on the process of ligand-induced channel activation and gating.